(Newport, Oregon) – The Greater Newport Chamber of Commerce’s Young Professionals will again hold the 4th Annual Amazing Race on Saturday, July 19. As in years past, challenges will be both mental and physical, with two person teams racing through Newport to cross the finish line. Challenges of the Annual Amazing Race are a surprise. Participants do not know whether they’re running, walking, boating, biking or scheming to get to their goal. No one knows what the obstacles will be as well. All they know is that it’s a scavenger-style race with challenges that may be mental, physical or both. The race has a Newport theme, so each of the challenges will be centered on something “Newport-ish,” as co-organizer Bobbi Price called it. Teams may consist of two men, two women, or co-ed, with participants being 15 years of age or older. Prizes will be awarded at the conclusion of the race and complimentary food and beverages will be provided to all participants, volunteers and sponsors. This year’s course happens primarily in the Deco district of Newport, with both the start and finish line at Yaquina Bay State Park. The course will be approximately three miles with eight challenge stops along the way. Registration is capped at 40 teams (80 people), said the Newport Chamber’s Bobbi Price. If you’re interested in watching the spectacle, you are urged to first come to Yaquina Bay State Park at the race’s start. Viewing the race is a bit tricky and takes some sleuthing. “We will give them ideas of viewing spots once the participants have begun,” said Price. “Due to the scavenger hunt style of the race, watchers are generally the ‘cheering crowd’ made up of family and friends of the participants. The race will draw a crowd as participants complete challenges but because the challenges are kept secret, there are no designated viewing spots. The Amazing Race start and finish line is located at Yaquina Bay State Park near the Fisherman’s Memorial Gazebo. Check-in begins at 8:00 a.m. on Saturday, July 19, with the race start time scheduled for 9:00 a.m. If you’d like to participate you can pre-register online at newportchamber.org or by calling Bobbi at the Newport Chamber of Commerce office, 541-265-8801. The participation fee is $40 per team and includes a t-shirt, food and beverages. Registration fees of $60 will be charged after July 13, 2014. Only 40 team slots are available so early registration is advised. 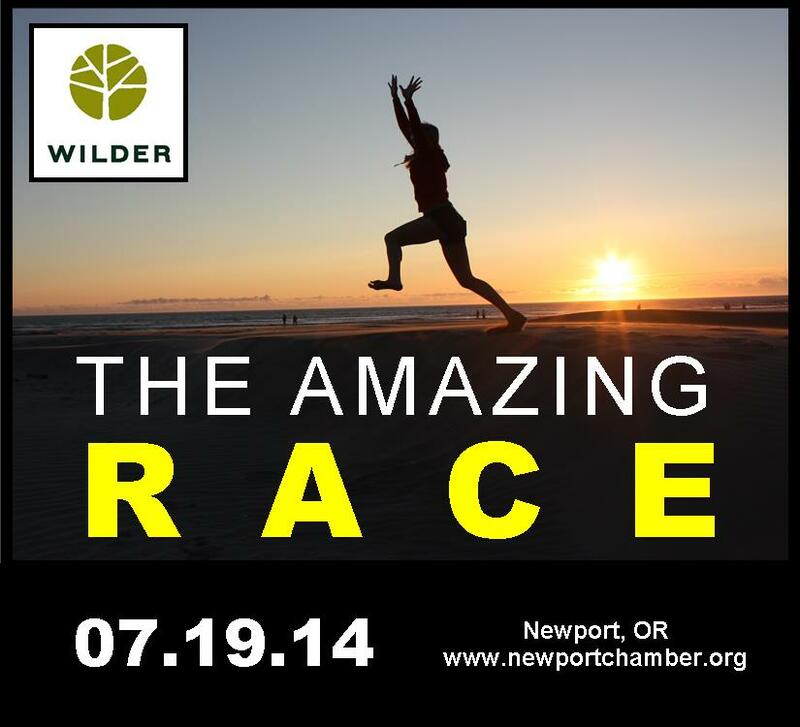 The Chamber would like to thank Wilder for signing on as the Presenting Sponsor of this year’s Amazing Race. Sponsors of the event also include News-Times, Bigfoot Beverages, True-Cut Engraving, Jamie’s Dockside Diner, Oregon Coast Event Rentals, OSU Federal Credit Union, Dutch Bros, Salon Ethos, Les Schwab and Instant Replay Sports & Kids. The Greater Newport Chamber of Commerce’s Young Professionals will hold their 4th Annual Amazing Race on Saturday, July 19. As in years past, challenges will be both mental and physical, with two person teams racing through Newport to cross the finish line. Teams may consist of two men, two women, or co-ed, with participants being 15 years of age or older. Prizes will be awarded at the conclusion of the race and complimentary food and beverages will be provided to all participants, volunteers and sponsors.